Spring is here and summer is coming which means your dog is probably scratching at the door to go outside…and ticks and fleas are on the prowl. We already have one blog post about using essential oils with dogs, but today I want to go into a little bit more detail about how to use aromatherapy to repel fleas and ticks from your dog. Several studies (like this one and this one) have been conducted to study the efficacy of using essential oils to repel fleas and ticks. 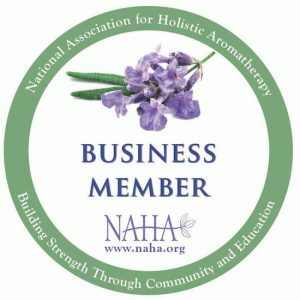 These studies, along with anecdotal and historical evidence, have shown that there are essential oils that may be helpful in protecting your dog, which is good news for those of us who prefer using natural, non-toxic remedies. 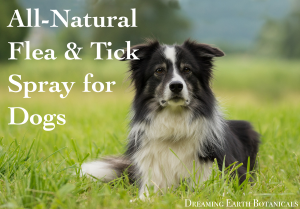 Below we list our favorite tick and flea repellent essential oils. Of course, please remember that dogs are like people: they are all unique and they all react to essential oils differently. Always be sure to dilute essential oils properly, to avoid application in sensitive areas, and to consult with your vet before using essential oils with your pet. Each of the above oils has been known to be useful for repelling pests from dogs. In this section, I’ll share a recipe for a Flea and Tick Repellent Spray that I have personally found to be effective for the dogs in my life. Of course, feel free to experiment with different combinations. If your dog is very sensitive, I recommend adding a few extra ounces of water to dilute the solution a bit or reducing the amounts of essential oil. Combine all the ingredients in a spray bottle and shake well. Spray on your dog’s fur. Shake well before each use as the oils and the water will likely separate naturally. If you have a small dog or a dog with sensitive skin, reduce the amounts of essential oils. I’d like to try this recipe out but I don’t have rose geranium. Is that different from regular geranium? If so, is it ok to use the regular geranium instead? Thank yoU! Hi Carmen, you can certainly use the geranium you have on hand. Thanks for the question! We don’t recommend using essential oils on cats. We get this questions a lot, actually, so I’m going to try and find some information to pass on. I’ll get back with you or if anyone else has any ideas, please weigh in! I can’t speak to any of them personally, but at least they all seem non-toxic and fairly simple to put together. Can I use Coconut oil instead of castor oil? Yes, I’d use the fractionated coconut oil so it stays liquid. I don’t have lavender or geranium. Will it still work? Well, we definitely like those two oils a lot, but if you don’t have them or can’t get hold of them, you can try it without those oils and maybe increase the concentration of some of the other oils (especially the cedarwood). Let us know! Are these best for using on an essential oil tag for my dog? They are felt inserts so I don’t how often to resoak it. Also should I also spray him (Boston Terrier) every time he goes out? I’d add more oil when the felt piece dries out. And yes, you can spray him when he goes out–give it a test run and make sure he doesn’t have any issues with the oils. Thanks! This may be a silly question but will this concoction work on humans as well? Hi Sherry, do you mean for dogs? What if i dont have the alcohol ? Hi Sherry, you could use witch hazel, or just not use anything and be sure to shake it really well before using it each time. Thanks for the fantastic post, very informative! Is this safe for a dog who has epilepsy? I would definitely check with your vet before using. Thank you!